There was a lot to like about the 2018 Tatts Finke Desert Race – both on and off track – as part of the second round of the BFGoodrich CAMS Australian Off Road Championship. 134 competitors took on the iconic desert, however Toby Price and eventual 2018 champions Shannon and Ian Rentsch stole the limelight. For Price, he put his skill and endurance to the test, competing on both four and two wheels in an attempt to make history, while the Rentschs added some more Finke silverware into their cabinet. There was plenty of opportunity for fans watching the event from near and afar to experience, as for the first time ever in its 44-year illustrious history, the Finke Checkpoint was beamed to off road fans around Australia and the world via a live stream. With the Finke Checkpoint being so remote, many friends and family of competitors, as well as general fans, who couldn’t attend one of the world’s most prestigious off road events were never able to see the event’s halfway checkpoint. 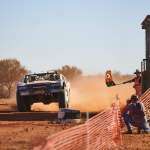 However in 2018, the new live stream allowed viewers to witness drivers cross the finish line of leg one at the Finke Checkpoint, as well as watching the start of the return leg to Alice Springs on day two. With a variety of live commentary, interviews and vision from all parts of the course, the first ever live steam of Finke was a resounding success. Take a look back and re-watch the first ever Finke live-stream below.